Back at work, I spent a day last week in Boston for the first-ever North American Software AG analyst event, attended by a collection of industry and financial analysts. It was a long-ish half day followed by lunch and opportunities for one-on-one meetings with executives: worth the short trip, especially considering that I managed to fly in and out between the snow storms that have been plaguing Boston this year. I didn’t live-blog this since there was a lot of material spread over the day, so had a chance to see some of the other analysts’ coverage published after the event, such as this summary from Peter Krensky of Aberdeen Group. The focus of the event was squarely on the digital enterprise, a trend that I’m seeing at many other vendors but not so many customers yet. Software AG’s CEO, Karl-Heinz Streibich kicked off the day talking about how everywhere you turn, you hear about the digital enterprise: not just using digital technology, but having enough real-time data and devices integrated into our work and lives that they can be said to be truly digital. Streibich feels that companies with a basis in integration middleware – like Software AG with webMethods and other products – are in a good position to enable digital enterprises by integrating data, devices and systems of all types. Although Software AG is not a household consumer name, its software is in 70% of the Fortune 1000, with a community of over 2M developers; it’s fair to say that you will likely interact with a company that uses Software AG products at least once per day: banks, airports and airlines, manufacturing, telecommunications, energy and more. Their revenues are split fairly evenly between Europe and the Americas, with a small amount in Asia Pacific. License revenues are 32% of the total, with maintenance and consulting splitting the remainder; this relatively low proportion of license revenue is an indicator of a mature software company, and not unexpected from a company more than 40 years old. I found a different representation of their revenues more interesting: they had 66% of their business in the “digital business” segment in 2014, expected to climb to 75% this year, which includes their portfolio minus the legacy ADABAS/NATURAL mainframe development tools. Impressive, considering that it was about a 50:50 split in 2010. Part of this increase is likely due to their several acquisitions over that period, but also because they are repositioning their portfolio as the Digital Business Platform, a necessary shift towards the systems of engagement where more of the customer spend is happening. Based on the marketecture diagram, this platform forms a cut-out layer between back office core operational systems and front office customer engagement systems. Middleware, by any other name; but according to Streibich, more business logic is moving to the middleware layer, although this is what middleware vendors have been telling us for decades. There’s definitely a lot of capable products in the portfolio that form this “development platform for digital business” – webMethods (integration and BPM), ARIS (BPA), Terracotta (in memory big data), Longjump (application PaaS), Metaquark (mobility), Alfabet, Apama, JackBe and more – but the key will be to see how well they can make them all work together to be a true platform rather than just a collection of Software AG-branded tools. The problem with this shift in business models is that conventional business applications don’t support the way that the new breed of business applications are designed, developed, used and operated. Current applications and development techniques are still valuable, but are being pushed behind the scenes as core operational systems and packaged applications. Software AG’s Digital Business Platform, then, is based on the premise that few packaged applications are useful in the face of business transformation and the required agility. We need tools to create adaptive applications – built to change, not to last – especially in front office customer engagement applications, replacing or augmenting packaged CRM and other applications. This is not fundamentally different from the message about any agile/adaptive/mashup/model-driven application development environment over the past few years, including BPMS; it’s interesting to see how a large vendor such as Software AG positions their entire portfolio around that message. In fact, one of their slides refers to the adaptive application platform as iBPMS, since the definition of iBPMS has expanded to include everything related to model-driven application development. The core capabilities of their platform include intelligent business operations (webMethods Operational Intelligence, Apama Streaming Analytics); agile processes (webMethods BPM and AgileApps); integration (webMethods Integration and API Management); in-memory data fabric (Terracotta); and business and IT transformation (ARIS BPA and GRC, Alfabet IT Portfolio Management and EA Management). In a detailed slide overlaying their products, they also added a transaction processing capability to allow the inclusion of ADABAS-NATURAL, as well as the cloud offerings that they’ve released over the past year. Jost dug further in to definitions of business application layers and architectural requirements. They provide the structure and linkages for event routing and event persistence frameworks, using relatively loose event-based coupling between their own products to allow them to be deployed selectively, but also (I imagine) to reduce the amount of refactoring of the products that would be required for tighter coupling. Their cloud IoT offering plays an interesting role by ingesting events from smart devices – developed via co-innovation with device companies such as Bosch and Siemens – for integration with on-premise business applications. We then heard two shorter presentations, each followed by a panel. First was Eric Duffaut, the Chief Customer Officer, presenting their go-to-market strategy then moderating a panel with two partners, Audi Lucas of Wipro and Chris Brinton of Mosaic Data Science. Their GTM plan was fairly standard for a large enterprise software vendor, although they are improving effectiveness by having a single marketing team across all products as well as improving the sales productivity processes. Their partners are critical for scalability in this plan, and provide the necessary industry experience and solutions; both of the partner panelists talked about co-innovation with Software AG, rather than just providing resources trained on the products. The second presentation and panel was led by John Bates, CMO and head of industry solutions; he was joined by a customer panel including Bryan Zigler of Boeing, Mark DuBrock of Standard&Poor, and Greg James of Outerwall. Bates discussed the role of industry solutions and solution accelerators, built by Software AG and/or partners, that provide a pre-built, customizable and adaptive application for fast deployment. They’re not using the Smart Process Application terminology that other vendors adopted from the Forrester trend from a couple of years ago, but it’s a very similar concept, and Bates announced the solution marketplace that they are launching to allow these to be easily discovered and purchased by customers. My issue with solution accelerators and industry solutions in general is that many of these solutions are tied to a specific version of the underlying technology, and are templates rather than frameworks in that you change the solution itself during implementation: upgrades to platform may not be easily performed, and upgrades to the actual solution likely requires re-customizing for each deployed instance. I didn’t get a chance to ask Bates how SAG helps partners and customers to create and deploy more upgradable solutions, e.g., recommended technology guardrails; this is a sticky problem that every technology vendor needs to deal with. After a wrapup by Streibich, we received copies of his latest book, The Digital Enterprise, plus Thingalytics by Bates; ironically, these were paper rather than digital copies. Disclosure: Software AG paid my airfare and hotel to attend this event, plus gave me a nice lunch and two books, but did not otherwise compensate me for my time nor for anything that I have written here. This week, I’m in Las Vegas for Kofax Transform, although just as an attendee this year rather than a speaker; expect to see a few notes from here over the two days of the conference. Yesterday’s keynote was less about TIBCO products and customers, and more about discussions with industry thought leaders about disruptive innovation. This morning’s keynote continued that theme with a pre-recorded interview with Vivek Ranadive and Microsoft CEO Satya Nadella talking about cloud, mobile, big data and the transformational effects on individual and business productivity. Nadella took this as an opportunity to plug Microsoft products such as Office 365, Cortana and Azure; eventually he moved on to talk about the role of leadership in providing a meaningful environment for people to work and thrive. Through the use of Microsoft products, of course. Thankfully, we then moved on to actual TIBCO products. We had a live demo of TIBCO Engage, their real-time customer engagement marketing product, showing how a store can recognize a customer and create a context-sensitive offer that can be immediately consumed via their mobile app. From the marketer’s side, they can define and monitor engagement flows — almost like mini-campaigns, such as social sharing in exchange for points, or enrolling in their VIP program — that are defined by their target, trigger and response. The target audience can be filtered by past interests or demographics; triggers can be a combination of geolocation (via their app), social media interactions, shopping cart contents and time of day; and responses may be an award such as loyalty points or a discount coupon, a message or both, with a follow link customized to the customer. A date range can then be set for each engagement flow, and set to be live/scheduled to start, or in a draft or review mode. Analytics are gathered as the flows execute, and the effectiveness can be measured in real time. Matt Quinn, TIBCO’s CTO, spoke about the challenges of fast data: volume, speed and complexity. We saw the three blocks of the TIBCO Fast Data platform — analytics, event processing, and integration — in a bit more detail, with him describing how these three layers work together. Their strategy for the past 12 months, and going forward, has three prongs: evolution of the Fast Data platform; improved ease of use; and delivery of the Fast Data platform including cloud and mobile support. The Fast Data platform appears to be a rebranding of their large portfolio of products as if it were a single integrated product; that’s a bit of marketing-speak, although they do appear to be doing a better job of providing integrations and use cases of how the different products within the platform can be combined. In the first part of the strategy, evolution of the platform (that is, product enhancements and new releases), they continue to make improvements to their messaging infrastructure. Fast, secure message transactions are where they started, and they continue to do this really well, in software and on their FTL appliances. Their ActiveSpaces in-memory data grid has improved monitoring and management, as well as multi-site replication, and is now more easily consumed via Node.js and other lighter-weight development protocols. BusinessWorks 6, their integration IDE, now provides more integrated development tooling with greatly improved user interfaces to more easily create and deploy integration applications. They’ve provided plug-ins for SaaS integrations such as Salesforce, and made it easier to create your own plug-ins for integration sources that they don’t yet support directly. 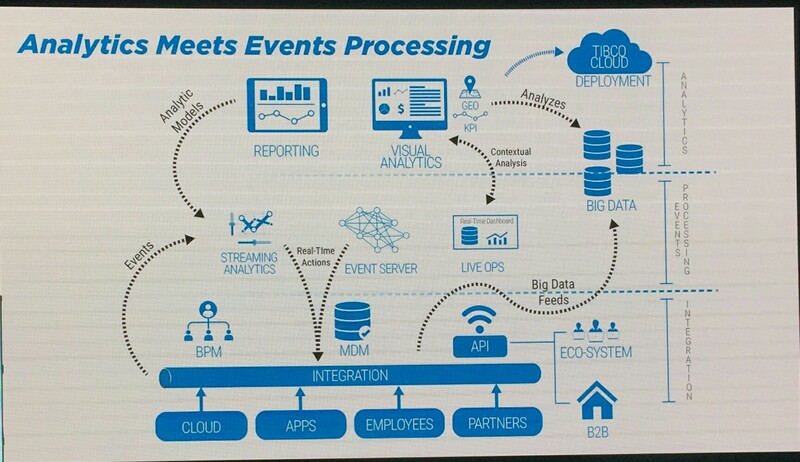 On the event processing side, they’ve brought together some related products to more easily combine stream processing, rules and live data marts for real-time aggregation and visualization. And to serve the internet of things (IoT), they are providing connectivity to devices and sensors. User experience is a big challenge with any enterprise software company, especially one that grows through acquisition: in general, user interfaces end up as a hodge-podge of inconsistent interfaces. TIBCO is certainly making some headway at refactoring these into a more consistent and easier to use suite of interfaces. They’ve improved the tooling in the BusinessWorks IDE, but also in the administration and management of integrations during development, deployment and runtime. They’ve provided a graphical UI designer for master data management (MDM). Presented as part of the ease of use initiative, he discussed the case management functions added to AMX BPM, including manual and automatic ad hoc tasks, case folder and documents with CMIS/ECMS access, and support for elastic organization structures (branch model). BPM reporting has also been improved through the integration of Jaspersoft (acquired by TIBCO earlier this year) with out of the box and customizable reports, and Jaspersoft also has been enhanced to more easily embed analytics in any application. They still need to do some work on interoperability between Jaspersoft and Spotfire: having two analytics platforms is not good for the customers who can’t figure out when to use which, and how to move between them. The third prong of the strategy, delivery of the platform, is being addressed by offering on-premise, cloud, Silver Fabric platform-as-a-service, TIBCO Cloud Bus for hybrid cloud/on premise configurations, consumable apps and more; it’s not clear that you can get everything on every delivery platform, and I suspect that customers will have challenges here as TIBCO continues to build out their capabilities. In the near future, they will launch Simplr for non-technical integration (similar to IFTTT), and Expresso for consuming APIs. They are also releasing TIBCO Clarity for cleansing cloud data, providing cleaner input for these situational consumable apps. For TIBCO Engage, which we saw demonstrated earlier, they will be adding next best engagement optimization and support for third-party mobile wallets, which should improve the hit rate on their customer engagement flows. He discussed some of the trends that they are seeing impacting business, and which they have on the drawing board for TIBCO products: socialization and gamification of everything; cloud requirements becoming hybrid to combine public cloud, private cloud and on premise; the rise of micro-services from a wide variety of sources that can be combined into apps; and HTML5/web-based developer tooling rather than the heavier Eclipse environments. They are working on Project Athena, a triplestore database that includes context to allow for faster decisioning; this will start to show up in some of the future product development. Good review of the last year of product development and what to expect in the next year. The keynote finished with Raj Verma, EVP of sales, presenting “trailblazer” awards to their customers that are using TIBCO technologies as part of their transformative innovation: Softrek for their ClearView CRM that embeds Jaspersoft; General Mills for their internal use of Spotfire for product and brand management; jetBlue for their use of TIBCO integration and eventing for operations and customer-facing services; and Three (UK telecom) for their use of TIBCO integration and eventing for customer engagement. Thankfully shorter than yesterday’s 3-hour marathon keynote, and lots of good product updates. Israel has a mandatory but mostly privatized healthcare system, and Maccabi Healthcare Services is the country’s second largest and fastest growing health maintenance organization (HMO), with about 1.9 million members using the services of 5,000 physicians. Maccabi’s chief enterprise architect, Irena Kurman, gave a presentation in the Integration and Automation breakout track at Innovation World on how they are putting the model-to-execution message into practice to improve their processes and integrate their legacy systems better. She talked about three case studies – medical referral follow-up, doctor visit management, and pregnancy tracking – that highlighted the challenges that they had with multiple systems and data sources, as well as uncontrolled and non-standardized processes. For example, their x-ray results process had point-to-point links between 14 different systems, making it very little to understand what was happening, much less consider modifications to the process. When something went wrong, there was no single process owner, and no visibility into the end-to-end process. They started with webMethods for integration and SOA governance, then have more recently started to model their processes using ARIS and automate some of these processes using webMethods BPMS. That original spaghetti x-ray process still has those same source systems, but now uses an ESB middleware layer, with the BPMS (as well as external partners) accessing the legacy systems via services: changes to the process are made in the BPMS, not by rewiring the legacy systems. The results in the case studies are pretty striking. In the medical referral follow-up process, they now have the ability to capture life-threatening cases in near real time, and since the entire process is linked and monitored, test samples can’t go missing without notice. For doctor visit management, payments to doctors are more accurate and are calculated in a transparent manner, improving relationships between Maccabi and their physicians. And for pregnancy tracking, a mobile application provides the patient with access to information relevant to her pregnancy stage, as well as view results such as recorded ultrasound video from anywhere. Kurman feels that they’ve just started on their journey to process excellence, but it looks like they have a good roadmap on how they’re going to get there. Wolfram Jost, CTO of Software AG, started us off on the first full day of Innovation World with a keynote on innovations for the digital enterprise. As I mentioned yesterday, the use of the term “digital enterprise” (and even more, “digitization”) is a bit strange, since pretty much everything is digital these days, it’s just not necessarily the right type of digital. We still need to think about integration between systems to make automation seamless, but more importantly, we need to think about interaction patterns that put control in the hands of customers, and mobile and social platforms that make the digital forms ubiquitous. So maybe the right phrase is that we have to start being intentionally digital enterprises, rather than let it happen accidentally. I definitely agree with Jost’s key point: it’s all about the process. We need end-to-end processes at the business/customer layer, but have to interact with a plethora of silos down below, both on premise and in the cloud, some of which are decades old. Software AG, naturally, provides tools to help that happen: in-memory data management, integration/SOA, BPM, EA and intelligent business operations (IBO, including event processing and analytics). This is made up of a number of acquisitions – Apama, alfabet, LongJump, Nirvana, JackBe – plus the pre-existing portfolio including ARIS and webMethods. Now, we’re seeing some of that on their Software AG Live PaaS vision for a unified cloud offering: Process Live for modeling and process publishing; Portfolio Live for IT portfolio management; AgileApps Live for application development and case management; and Integration Live for cloud-to-cloud and cloud-to-on premise integration. Integration Live is coming next year, but the rest of the platform is available as of today. We had a demo of Process Live, which provides cloud-based BPMN process modeling including collaboration; and Portfolios Live to see the systems with which the modeled processes may interact, including a wide variety of portfolio management functions such as assessing the usage and future development potential of any given system or application. We also saw an AgileApps Live application, including an analytics dashboard plus forms data entry and task/case management; interestingly, this is still sporting a longjump.com URL. I last reviewed LongJump in 2007 in conjunction with the Enterprise 2.0 conference, and obviously there have been some advances since then: it’s still an application development tool for web-based apps, but includes a lot of ad hoc task/case management functionality that allows the knowledge worker to create their own multi-step tasks (subprocesses, in effect) as well as perform other case-type functionality such as gathering artifacts and completing tasks related to a case resolution/completion. Although Integration Live isn’t there yet, we did hear about the different deployment styles that will be supported: development and/or operations can be in the cloud; there can be an on premise ESB or direct connections to systems. I’m sure that we’ll see a lot more about these over the next two days so I’m not trying to cover everything here. We had a brief demo from John Bates on audience sentiment analysis for price level setting using Apama, then wrapped up with a presentation from Edy Liongosari, Managing Director at Accenture on how to bring some of this into practice. One thing that Liongosari said really resonated: next year, none of us are going to be talking about cloud, because it will be so ubiquitous. Same is true, I believe, of the terms social and mobile. Not to mention digital. For the first time in a few years, I’m at Software AG’s Innovation World conference in San Francisco (I think that the last time I was here, it was still the webMethods Integration World), and the focus is on the Digital Enterprise. At the press panel that I attended just prior to this evening’s opening keynote, one journalist made the point that “digital enterprise” is kind of a dumb term (I paraphrase here) because everything is digital now: we need a more specific term to mean what Software AG is getting at with this. Clay Richardson of Forrester, who I dragged along to the press session, said that his colleagues are talking about the post-digital age, which I take to mean is based on the assumption that all business is digital so that term is a bit meaningless, although “post-digital” isn’t exactly descriptive either. We heard briefly from Ivo Totev, Software AG’s CMO; saw presentations of two of their customer innovation awards; then had a lengthier talk on the power of mobile and social from Erik Qualman, author of Socialnomics and Digital Leader. Unlike the usual pop culture keynote speaker, Qualman’s stuff is right on for this audience: looking at how successful companies are leveraging online social relationships, data and influence to further their success through engagement: listening, interacting and reacting (and then selling). He points out that trying to sell first before engaging doesn’t work online because it doesn’t work offline; the methods of engagement are different online and offline, but the principles from a sales lead standpoint are the same. You can’t start the conversation by saying “hey, I’m great, buy this thing that I’m selling” (something that a *lot* of people/companies just starting with Twitter and/or blogging haven’t learned yet). Qualman took the popular Dave Carroll’s “United Breaks Guitars” example from a couple of years ago, and talked about not just how United changed their policies on damage as a result of this, but the other people who leveraged the situation into increased sales: Taylor Guitars; a company that created a “Dave Carroll” travelling guitar case; and Carroll himself through sales of the song and his subsequent book on the power of one voice in the age of social media. He looked at companies that have transformed their customer experience through mobile (e.g., Starbucks mobile app, which has personally changed my café loyalty) by giving the customer a way to do what they want to do – which hopefully involves buying your product – in the easiest possible way; and how a fast and slightly cheeky social media presence can give you an incredible boost for very little investment (e.g., Oreo’s “dunk in the dark” tweet when the lights went out during the Superbowl). I gave a presentation last year on creating your own process revolution that talked about some of these issues and the new business models that are emerging because of it. Great to see John Bates here, who I know from his tenure at Progress Software and came on at Software AG with the Apama acquisition, as well as finally meet Theo Priestley face to face after years of tweeting at each other. Disclosure: Software AG is a customer (I’m in the middle of creating some white papers and webinars for them), and they paid my travel expenses to be at this conference. However, what I write here is my own opinion and I have not been financially compensated for it. 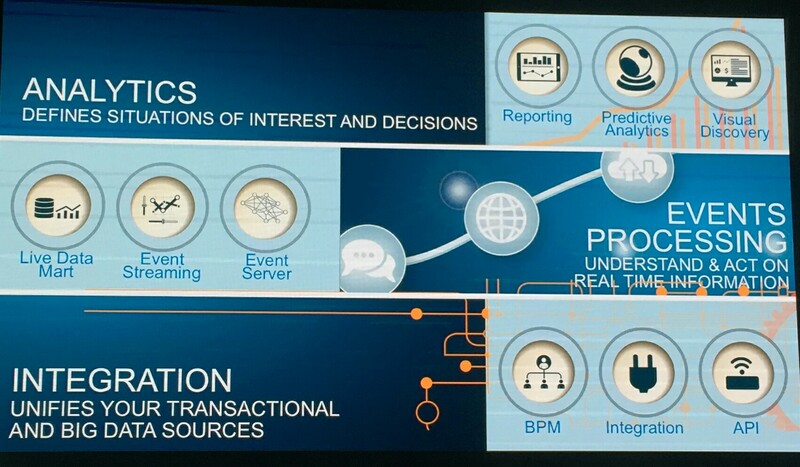 A bit disappointing to see BPM relegated to being just a piece of the automation middleware, but important to remember that TIBCO is an integration technology company at heart, and that’s ultimately what BPM is to them. Taking a look at their corporate performance, they have almost $1B in revenue for FY2011, showing growth of 44% over the past two years, with 4,000 customers and 3,500 employees. They continue to invest 14% of revenue into R&D with a 20% increase in headcount, and significant increases in investment in sales and marketing, which is pushing this growth. Their top verticals are financial services and telecom, and while they still do 50% of their business in the Americas, EMEA is at 40%, and APJ making up the other 10% and showing the largest growth. They have a broad core sales force, but have dedicated sales forces for a few specialized products, including Spotfire, tibbr and Nimbus, as well as for vertical industries. They continue to extend their technology platform through acquisitions and organic growth across all five areas of the platform functionality. They see the automation components as being “large and stable”, meaning we can’t expect to see a lot of new investment here, while the other four areas are all “increasing”. Not too surprising considering that AMX BPM was a fairly recent and major overhaul of their BPM platform and (hopefully) won’t need major rework for a while, and the other areas all include components that would integrate as part of a BPM deployment. Matt Quinn then reviewed the technology strategy: extending the number of components in the platform as well as deepening the functionality. We heard about some of this earlier, such as the new messaging appliances and Spotfire 5 release, some recent releases of existing platforms such as ActiveSpaces, ActiveMatrix and Business Events, plus some cloud, mobile and social enhancements that will be announced tomorrow so I can’t tell you about them yet. We also heard a bit more on the rules modeling that I saw before the sessions this morning: it’s their new BPMN modeling for rules. This uses BPMN 1.2 notation to chain together decision tables and other rule components into decision services, which can then be called directly as tasks within a BPMN process model, or exposed as web services (SOAP only for now, but since ActiveMatrix is now supporting REST/JSON, I’m hopeful for this). Sounds a bit weird, but it actually makes sense when you think about how rules are formed into composite decision services. There was a lot more information about a lot more products, and then my head exploded. Like others in the audience, I started getting product fatigue, and just picking out details of products that are relevant to me. This really drove home that the TIBCO product portfolio is big and complex, and this might benefit from having a few separate analyst sessions with some sort of product grouping, although there is so much overlap and integration in product areas that I’m not sure how they would sensibly split it up. Even for my area of coverage, there was just too much information to capture, much less absorb. We finished up with a panel of the top-level TIBCO execs, the first question of which was about how the sales force can even start to comprehend the entire breadth of the product portfolio in order to be successful selling it. This isn’t a problem unique to TIBCO: any broad-based platform vendor such as IBM and Oracle have the same issue. TIBCO’s answer: specialized sales force overlays for specific products and industry verticals, and selling solutions rather than individual products. Both of those work to a certain extent, but often solutions end up being no more than glorified templates developed as sales tools rather than actual solutions, and can lead to more rather than less legacy code. Because of the broad portfolio, there’s also confusion in the customer base, many of whom see one TIBCO product and have no idea of everything else that TIBCO does. Since TIBCO is not quite the household name like IBM or Oracle, companies don’t necessarily know that TIBCO has other things to offer. One of my banking clients, on hearing that I am at the TIBCO conference this week, emailed “Heard of them as a player in the Cloud Computing space. What’s different or unique about them vs others?” Yes, they play in the cloud. But that’s hardly what you would expect a bank (that uses very little cloud infrastructure, and likely does have some TIBCO products installed somewhere) to think of first when you mention TIBCO. Back from the mid-morning break, CMO Raj Verma shifted gears from customer experience management to look at one of the other factors introduced in the first part of the session: big data. Matt Quinn was back to talk about big data: in some ways, this isn’t new, since there has been a lot of data within enterprises for many years. What’s changed is that we now have the tools to deal with it, both in place and in motion, to find the patterns hiding within it through cleansing and transformation. He makes a sports analogy, saying that a game is not just about the final score, but about all of the events that happen to make up the entire game; similarly, it is not sufficient any more to just measure outcomes in business transactions, you have to monitor patterns in the event streams and combine that with historical data to make the best possible decisions about what is happening right now. 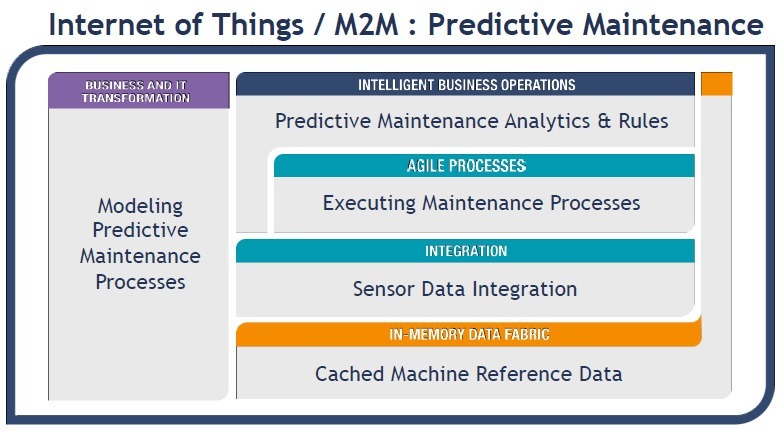 He referred to this combination of event processing and analytics as closing the loop between data in motion and data at rest. TIBCO provides a number of products that combine to handle big data: not just CEP, but ActiveSpaces (the in-memory data grid) to enable realtime processing, Spotfire for visual analytics and integration with Hadoop. We saw a demo of LogLogic, recently acquired by TIBCO, which provides analytics and event detection on server logs. This might sound like a bit of a boring topic, but I’m totally on with this: too many companies just turn off logging on their servers because it generates too many events that they just can’t do anything with, and it impacts performance since logging is done on the operational server. LogLogic’s appliance can collect enormous amounts of log data, detect unusual events based on various rules, and integrate with Spotfire for visualization of potential security threats. Mark Lorion, CMO for TIBCO Spotfire, came up to announce Spotfire 5, with a complete overhaul to the analytics engine, and including the industry’s first enterprise runtime for the R statistical language, providing 10 times the performance of the open source R project for predictive analytics. Self-service predictive analytics, ftw. They are also going beyond in-memory, integrating with Teradata, Oracle and Microsoft SQL Server for in-database analysis. With Teradata horsepower behind it – today’s announcement of Spotfire being optimized for in-database computation on Teradata – you can now do near-realtime exploration and visualization of some shocking amounts of data. Brad Hopper gave us a great Spotfire demo, not something that most TUCON attendees are used to seeing on the main stage. Rob Friel, CEO of PerkinElmer, took the stage to talk about how they are using big data and analytics in their scientific innovations in life sciences: screening patient data, environmental samples, human genomes, and drug trials to detect patterns that can improve quality of life in some way. They screened 31 million babies born last year (one in four around the globe) through the standard heel-prick blood test, and detected 18,000 with otherwise undiagnosed disorders that could be cured or treated. Their instrumentation is key in acquiring all the data, but once it’s there, tools such as Spotfire empower their scientists to discover and act on what they find in the data. Just as MGM Grand is delivering unique experiences to each customer, PerkinElmer is trying to enable personalized health monitoring and care for each patient. To wrap up the big data section, Denny Page, TIBCO’s VP of Engineering, came on stage with his new hardware babies: a FTL Message switch and an EMS appliance, both to be available by the end of November 2012. For the final part of the day 1 keynotes, we heard from an innovators’ panel of Scott McNealy (founder of Sun Microsystems, now chairman of Wayin), Tom Siebel (founder of Siebel Systems, now at C3 Energy where they are using TIBCO for energy usage analytics), Vivek Ranadivé, and KR Sridhar (CEO of Bloom Energy), chaired by David Kirkpatrick. Interesting and wide-ranging discussion about big data, analytics, sentiment analysis, enterprise social media, making data actionable, the internet of things and how a low barrier to platform exit drives innovation. The panel thinks that the best things in tech are yet to come, and I’m in agreement, although those who are paranoid about the impact of big data on their privacy should be very, very afraid. I’ll be blogging from the analyst event for the rest of the day: we have corporate and technology briefings from the TIBCO execs plus some 1:1 sessions. No pool time for me today! IBM Impact Day 2: Engage. Extend. Succeed. Phil Gilbert spoke at the main tent session this morning, summarizing how they announced IBM BPM as a unified offering at last year’s Impact, and since then they’ve combined Business Events and ILOG to form IBM ODM (operational decision management). Business process and decision management provide visibility and governance, forming a conduit to provide information about transactions and data to people who need to access it. IBM claims to have the broadest, most integrated process portfolio, having taken a few dozen products and turned them into two products; Phil was quick to shoot down the idea that this is a disjointed, non-integrated collection of tools, referring to it instead as a “loosely coupled integration architecture”. Whatever. Around those two core products (or product assemblies) are links to other enterprise tools – Tivoli, MDM, ECM and SAP – forming the heart of business processes and system orchestration. In version 8 of BPM and ODM, they’ve added collaboration, which is the third key imperative for business alongside visibility and governance. We saw a demo of the new capabilities, most of which I talked about in yesterday’s post. For ODM, that included the new decision console (social activity stream, rules timeline) and global rules search. For BPM, there’s the new socially-aware process portal, which has been created on their publicly-available APIs so that you can roll your own portal with the same level of functionality. There’s searching in the process portal to find tasks easily. The new coach (UI form) designer allows you to create very rich task interfaces more easily, including the sidebar of task/instance details, instance-specific activity stream, and experts available for collaboration. They’ve incorporated the real-time collaboration capabilities of Blueworks Live into the BPM coaches to allow someone to request and receive help from an expert, with the user and the expert seeing each other’s inputs synchronously on the form in question. Lastly, Approve/Reject type tasks can be completed in-line directly in the task list, making it much faster to move through a long set of tasks that require only simple responses. He wrapped up with the obligatory iPad demo (have to give him credit for doing that part of the live demo himself, which most VPs wouldn’t consider). The general session also included presentations of some innovative uses of BPM and ODM by IBM’s customers: Ottawa General Hospital, which has put patient information and processes on an iPad in the doctors’ pockets, and BodyMedia, which captures, analyzes and visualizes a flood of biometric data points gathered by an armband device to assist with a weight loss program. Author sandyPosted on May 1, 2012 Categories BPM, CEP, DM, SOATags ibmimpact5 Comments on IBM Impact Day 2: Engage. Extend. Succeed.